What is the Language of Film and Video? The first steps in the production of a film or video is to learn the visual language of moving images. Great film and video storytelling requires knowing the language of film and when and how to use it. Professional film and video productions assign names to commonly used shot types. 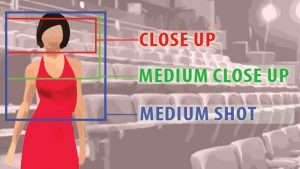 Knowing these terms save time when communicating with the crew and are part of “film grammar.” Using these camera shots, combined with perspective tricks, will enable you to plan out your scenes in an easy-to-read visual shorthand. One of the many director/filmmaker’s goal is to visually guide the audience’s attention to “where to look in the frame” in order to hold their attention and move the narrative forward. (i.e. showing or revealing the most important story information at the appropriate moment). Shots and camera placement can be used to communicate extra meaning which will deepen the audience’s emotional engagement with the story. What are the basic camera shot types? Close Up Shot (CU): A close range of distance between camera and subject. Used to bring a viewer in closer contact to the action. Used to draw the audience’s attention to a character (i.e. reaction) or to an element in the frame. Extreme Close Up Shot (ECU): show extreme detail. Medium Shot (MS): Waist up of a character or medium distance from subject. Primarily used after a subject has already been introduced so that there has already been context. Used to relieve a tense moment. Wide Shot (WS) or Long Shot: The camera’s subject (person) takes up the full height of the frame. A small amount of room is left above the subject’s head and below the subjects feet, making the wide shot of the person appear comfortably placed in the frame. Extreme Wide Shot (EWS) A variation of the WS which is often used as the Establishing Shot. Establishing Shot (ES): Used to establish an area/location. Establishing shots present a lot of information but not necessarily a lot of detail. Use it to provides the feel for where “we” are in space and time. Master shots are usually done in a extreme wide shot. This is a filmmaking technique of shooting the entire scene’s action (start to finish) in long shot. Subsequently, filmmakers re-shoot same action in medium or close ups which can be edited in post production. A/k/a the extreme long shot (used for epic views and panoramas). In addition to shot types, there are short cuts to communicating camera placement of the shots. These too, can have emotional implications for the audience. Point of View Shot (POV): Shows a view from a character’s perspective. A subjective view of an individual’s vision. Something other than the current subject/action. An interruption used to adjust pacing, heighten tension. When using film, a shot is described as a single take. (The standard has been 24 frames per second.) When storyboarding, a frame represents a single shot. Storyboard frames (sometimes called panels) attempt to communicate the essence or major action of the scene. Multiple scenes make up a sequence. When storyboarding a complex scene or sequence in which the action extends to more than one location, create multiple frames representing the shots needed to depict the action. Ultimately, getting your audience’s attention begins with a compelling story. The story can then be visually supported and emotionally punctuated by the composition of the shots. The goal of your shot choices is not only to tell the story but also create an emotional reaction in the audience. Deepening the emotional connection can be accomplished with the choice of shot types in a sequence and knowing when to use them. When storyboarding, notice that the length of the sequences can also create a rhythm – a visual rhythm. This can be planned with storyboards and tested with animatics. The actual story rhythm is accomplished during editing in post production. However, you can’t edit in what you don’t shoot. And you can’t shoot something if you don’t know you need it. How’s that for some creative logic. So a good visual plan is a good start. Visualizing is the process of ‘imagining a goal’ while actually working toward a opportunity to review and refine it. Storyboarding has become the workhorse of the pre production phase. Finally: Show vs tell. Use dialogue sparingly wherever possible. For great film and video storytelling, knowing the language of film and when and how to use it is valuable. Remember to show the story, show the emotion and show the events with imagery rather than using “talking heads” of people telling the story. 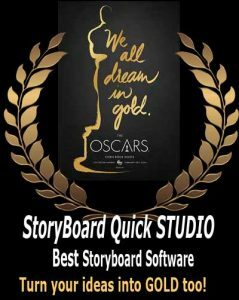 Bottom Line: Storyboards are a great first step to take after finishing a great script.